We're actually thankful to have made it to Chefchaouen all in one piece. On the final kilometer of a steep climb up to the city, a jam-packed bus came barreling down the road at top speed and was taken by surprise by a broken down delivery truck blocking the route behind a sharp bend in the road. The driver slammed on the brakes, went into a long skid and came to a sharp stop just meters in front of two very shaken-up cyclists. 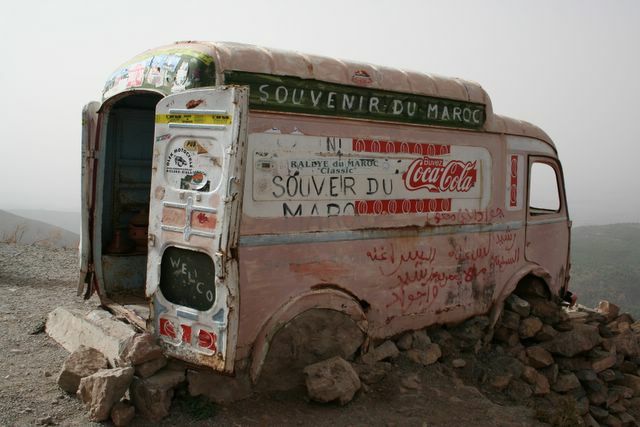 Out of nowhere the truck driver appeared (perhaps he had been dozing in the cab), sauntered over to where we were recovering from the fright and remarked calmly 'Les gens sont fous.' Indeed, there are a lot of crazy people in the world. As we dined on Chefchaouen's main square late one sunny afternoon, our impression of Morocco was hardly that of an exotic land full of intrigue and mystery. We were surrounded by other European vacationers in an area where restaurant menus were available in four different languages and one could hardly make it 10 meters down the street without an invitation to have a look in a shop stocked with Berber handicrafts or handmade carpets juste pour le plaisir les yeux, as we so often heard. 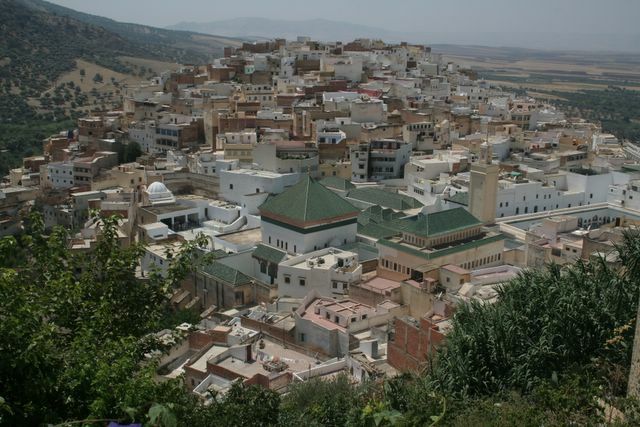 Nonetheless we spent almost an entire week lazing about in Chefchaouen. One day when we had had enough of browsing the markets and people watching, we decided to head up into the mountains of the Rif Mountains National Park, the entry of which was just a stone's throw from our campsite. Uncertain as to which path to follow as the road came to a fork, we flagged down a man on a donkey and asked for directions . 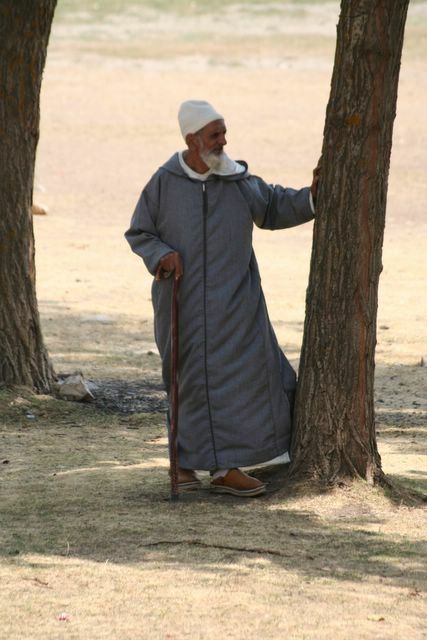 In addition to Arabic and a Berber dialect, the gentleman spoke Spanish, which is in fact quite common in northern Morocco given that the area was under Spain's rather than France's influence. Off to the left, he explained with pride, there were plantas grandes. Hmmmm. Big plants. No need to ask which kind of big plants he was referring to since the Rif region was well-known for its cultivation of marijuana. Not wanting to get mixed up with any dodgy individuals who might have been involved with those plantas grandes, we chose to take a right instead. The path took us up to an altitude of more than 2000 meters and along the way we spotted some pretty impressive looking five-leaved plants as well. Sore muscles the following day were proof enough for us that cycling and hiking work different parts of the body. Needing to 'recover' was, however, a good excuse to be lazy for another day and postpone facing the heat of the plains. Our next destination was the imperial city of Meknès, famous for its well-preserved medina dating back to the 10th century. Leaving Chefchaoun, after just a few hours of cycling through wooded areas, we were once again down on the flatlands and, with temperatures in the 40s and trees harder to find than public restrooms in Spain, cycling was tough. We carried on until late into the afternoon and suddenly realized that we were in the middle of NOWHERE. We had just passed through the last town of any size indicated on our Marco Polo map and it had no hotels or even a simple room to rent above a café. Not knowing what to do, we sought the assisance of a helpful police officer who suggested we camp at the service station just down the road. This immediately conjured up images of a lone pump on a dusty plot of land surrounded by stray dogs and debris. You can imagine what a pleasant surprise we had upon arriving at the sparkling new Afriquia Service Center with its lush lawn, chic café and functioning toilets. We were given a spot on the roof to pitch the tent, from which we had a bird's eye view of the spectacle below. Afriquia was obviously THE place to be on a Friday night. As soon as the sun went down, cars starting pulling in, not to fill up with gas, but to enjoy a high-priced cup of coffee on the Paris-style terrace overlooking the pumps. This provided a good bit of entertainment until we snuggled up in the tent and were lulled to sleep by the Arabic pop music being blasted out of the meter-high speakers, only to be woken up a little later to the sounds of the muezzin calling the faithful to worship in Afriquia's own in-station mosque. Our travel guide ranks Volubilis and its Roman ruins (yes, ROMAN!) 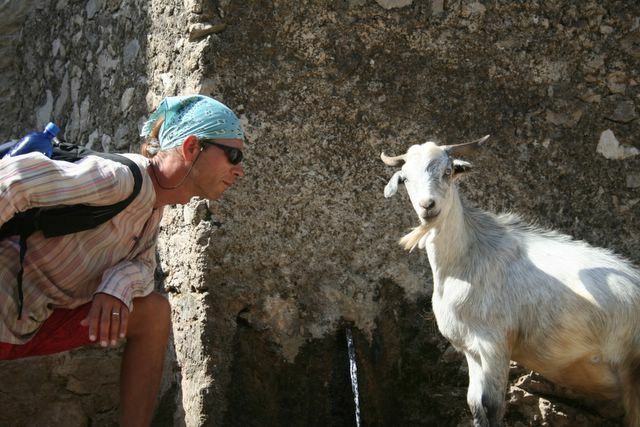 as one of the highlights of a trip to Morocco. Blame it on the unrelenting sun, but we missed the 'amazing mosaics and truly Triumphal Arch'. When we reached the junction where the site was signposted as being just three kilometers away, we took a quick look at each other and continued on towards the campground. The lure of a patch of shade and a bit of respite from the UV rays had won out over culture, history and personal edification. 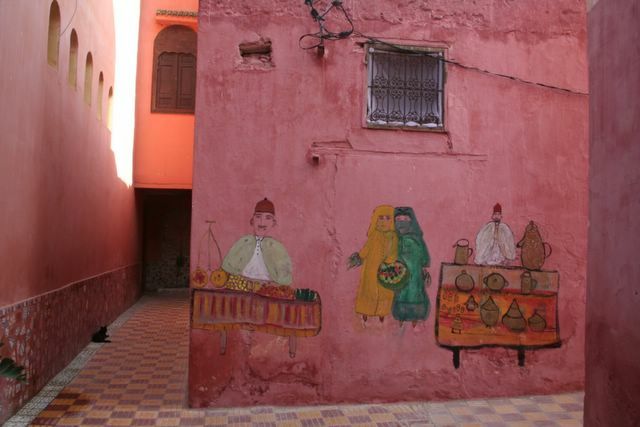 In the souks of Meknès we found the exotic Morocco we had been in search of. 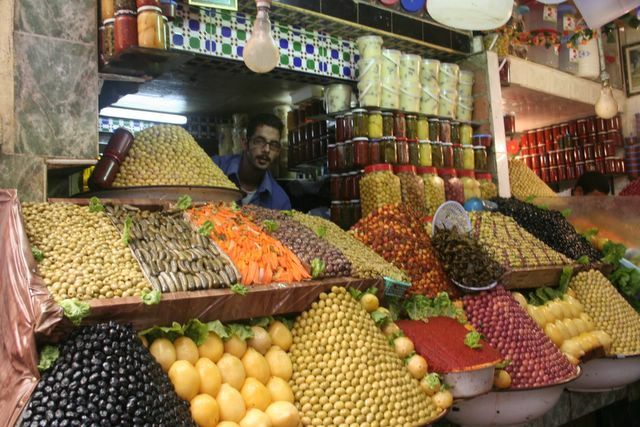 Food markets brimming with artistically arranged olives, dates, almonds and colorful fruits stacked up in precarious pyramids. Butchers hacking away at all sorts of animal parts from the head to the hooves. Bearded men in flowing robes hawking 'antique' carpets and flimsy souvenirs to unsuspecting tourists. Best of all, amid all the hustle and bustle, stumbling upon a quiet shaded courtyard with a simple café serving up a mean mint tea and offering a cool place to rest tired feet. Still in search of cooler temperatures, we headed back up into the mountains to Azrou, a quiet Berber town surrounded by the cedar forests of the Middle Atlas. Again, almost a week went by before we could face the furnace that awaited us back down on the plains. 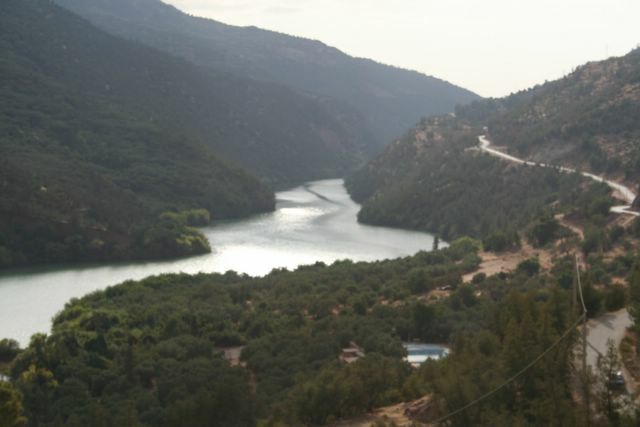 We had gotten more than enough rest in Chefchaouen, so we spent the time cycling around the area, up to Morocco's premier ski resort, Mischliffen, to Ifrane, or little Switzerland as the locals like to think of it, and we spent a day trying to find all the lakes on the Lake circuit. 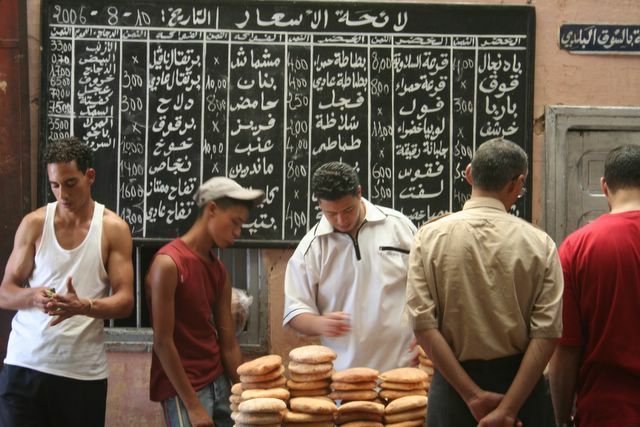 We certainly would have been more successful if the signposting wasn't just in Arabic at some key crossroads. As we made plans to move on, Hassan, the hospitable owner of the Azrou campsite, warned us about the scenic route we planned to take leading to the waterfall Oum-er-Rbia. I sent a pair of Dutch cyclists up that way not long ago. The left before dawn, but were back by 9AM. They couldn't take the hills. We decided to give it a try anyway, and found out that the hills weren't half as bad as the kids lining the route. Up until that point we had only been greeted by big waves and enthusiastic bonjours--never any begging. That day the kids were out in droves to hassle the tourists. We reckon they were fed up with their requests for bombons, pens and money all being ignored by the passing motorists, and had decided to take out their frustrations out on us. Gangs of pre-adolescent boys darted out in front of the bikes to block the road and even a few girls couldn't resist a tug on the back of the cycles. It was all very tiring and a pity to see what a negative impact tourism has had on the local population. 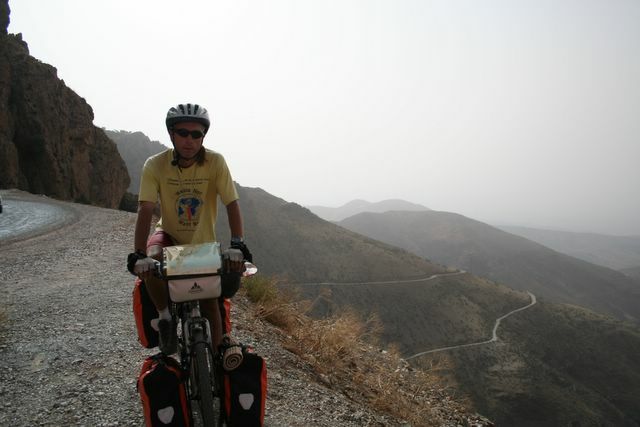 Next came more cycling through the gentle hills of the Middle Atlas south of Khenifra with some spectacular scenery along the way. One afternoon we spotted a patch of grass (very rare commodity in these dry parts) with a bit of shade (even rarer) along the highway and decided it would be the perfect spot for a picnic. Just as we were getting settled down to a fine meal of olives, Laughing Cow cheese and a crusty baguette, the owner of the property turned up. Not in the least bit bothered by our presence, he insisted on bringing down a table and chairs and even served us a pot of tea after the meal. After having refilled our water bottles with refreshingly cool water from his well, we were sent off with some delicious figs and wishes of bon courage. 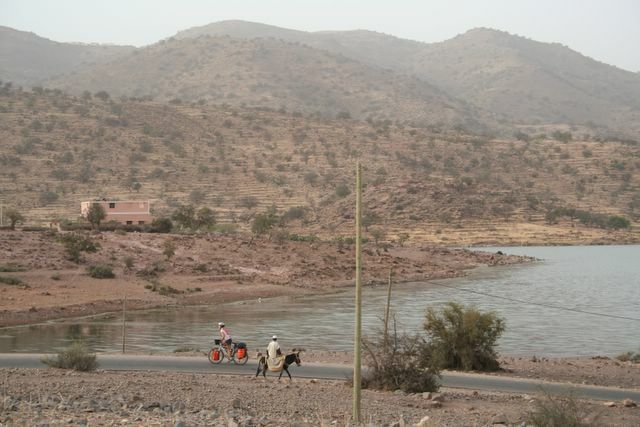 A brief stint back down on the plains near Beni-Mellal led us back up into the mountains as we decided that the rigors of the hills were preferable to roasting on the flatlands. A steep climb that wound round and round the mountainside and then whoosh down the other side in a flash with fantastic views of the crystal- clear waters of the lake below. We spent the night at the derelict campsite below the Bin-el Ouidane dam and (unsurprisingly) had the place to ourselves. The campground was in ruin and surely the toilets hadn't received even a yearly scrub down. Fortunately, the peaceful lake made up for the lack of creature comforts and cleanliness and, in any case, we had little choice, as our weary legs needed a rest before the climb back up out of the mountains. The next morning as we pulled up to the tiny shop perched on the top of the mountainside, hoping to fill up on sugary cakes and fizzy drinks, Mustapha, the guardian of the local school, invited us to have tea with his family. A short walk over the rocky terrain as he shooed the goats away and cleared a path for the bicycles, brought us to his simple three-room home where he lived with his wife and five children. 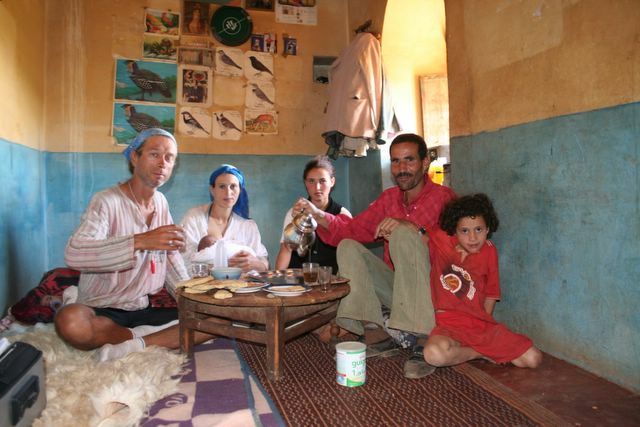 As we sat around sipping mint tea and munching on almonds, Mustapha spoke of the low wages and high cost of living in Morocco, and his hopes of obtaining a passport and visa in order to travel to Spain and work in the agriculture sector. 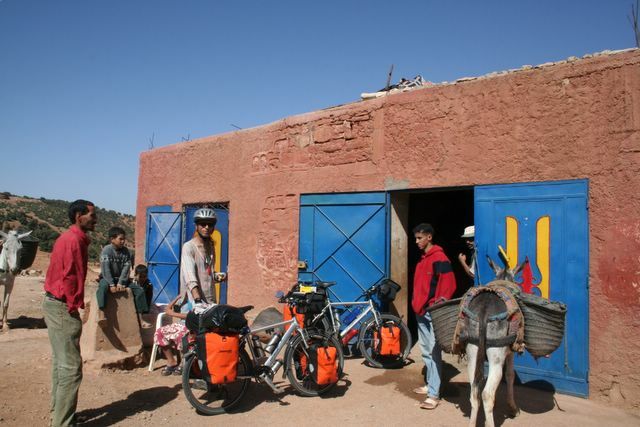 This was in fact fairly common in his village and several of the teachers at his school had already made the trip and come back with substantial savings (by Moroccan standards). We enjoyed getting to know the family, but eventually decided it was time we were on our way, so we wished him luck with his endeavors, thanked him for his kind hospitality and then enjoyed the easy ride down to Azilal and on to Demnate. 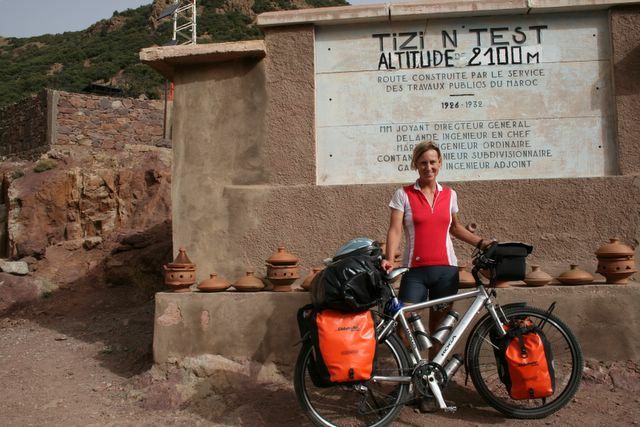 A nasty stomach bug meant Amaya spent the entire following day huddled up in bed hoping to get back enough strength to pedal the remaining 100 km to Marrakesh. Being of hardy Nordic stock, she was up at 5am the next day and raced on through the heat to Morocco's most touristic city. And tourists there were. We checked into what seemed to be a quiet hotel near the medina with 15 simple rooms around a tiled courtyard. What we didn't know was that there were at least 40 boisterous backpackers camping out on the roof. 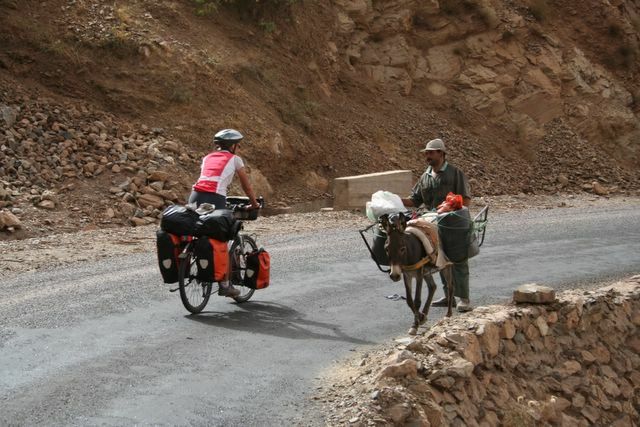 No amount of polite requests, threats or begging could get them to quiet down, so we were rather bleary-eyed as we rode out past the Palmeraie two days later on our way to conquer the Tizi-n-Test pass. Lack of sleep meant fatigue set in quickly and after just 50 km we reached Asni and decided to call it a day. There was a youth hostel of sorts, but the dark prison-like rooms were so uninviting that we decided to pitch the tent in the shady garden instead. The mountains were bathed in a soft light early the next morning as we set off for what promised to be a grueling day of cycling, with almost 100 km separating us from the pass at 2,100 meters. We were in the High Atlas now and the mountains were stunning. 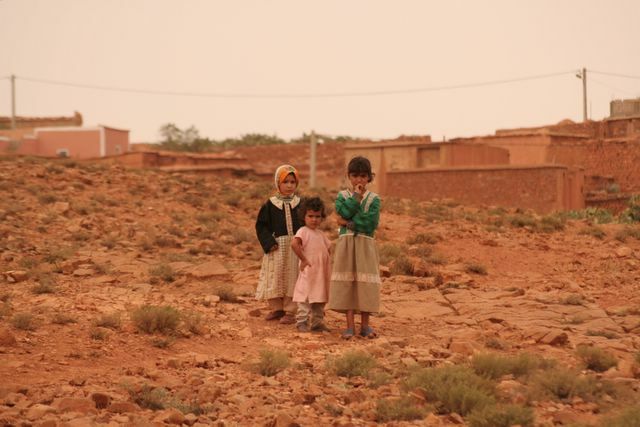 Spectacularly rugged and sparsely vegetated with tiny Berber villages perched precariously in the oddest of places. The lower valleys we crossed were lush with apples, almonds and apricots nourished by intricate irrigation systems that channel water from high up in the mountains. As we neared the top, the road spiraled around the mountain and with each oncoming vehicle we were greeted with cheers. Amaya seemed to receive more than her fair share with the 'Allez, madame! ''s outnumbering those for monsieur. Camping at the pass sounded romantic, but with the wind howling all night we could only hope not to be swept down into the valley below. 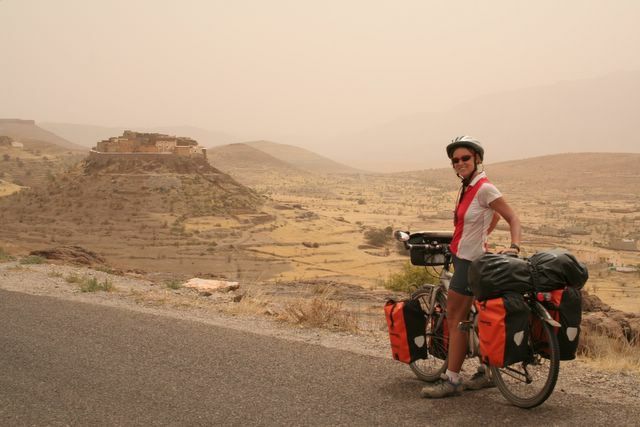 The next morning, a short ride through the fertile Souss Valley past olive groves and orange orchards brought us to the pleasant mud-walled city of Taroudant, which provided the perfect resting spot. 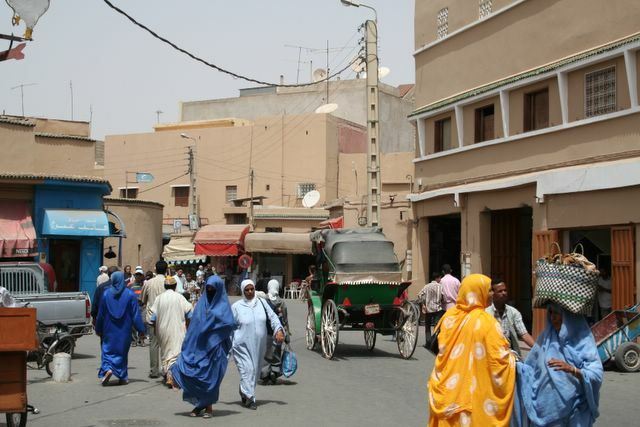 We took a room with a terrace overlooking the main square and enjoyed watching the endless stream of bicycles, motorcycles, donkey carts and horse-drawn carriages criss-cross the town. The markets were less of a hassle than Fès or Marrakesh and we could admire the fine craftsmanship of the jewelery, pottery and baskets without any overly-anxious salesmen breathing down our necks. Well-rested, we were ready to tackle the arid Anti Atlas, the last mountain range before the long and lonely ride through the Sahara. Our plan to take what appeared to be a direct route to Tafraroute following a minor road over the mountains was squelched when the local police officers insisted that we use the brand-new expressway. This was the route for tourists, they insisted, and our security couldn't be assured if we chose to set off in another direction. What dangers awaited us we'll never know as the policeman made it quite clear that the road in question was off limits to itinerant cyclists. Perhaps they were only concerned about us getting lost, which in fact we did, not long after turning off the expressway. The road forked and in the absence of any road signs we chose to go left. The road got narrower and bumpier as the kilometers passed and it looked as if we were headed straight for a steep mountainside. All of a sudden a bearded and turbaned gentleman in a beat-up old Mercedes pulled up and inquired as to where we could possibly be headed. To Tafraroute, of course! With a sigh and chuckle he directed us back to the main route and we were again headed in the right direction. We were impressed by the lunar landscapes as we traversed the barren mountains, and the effort to cross the Tizi Mlil pass at 1662 meters was duly rewarded as we caught sight of our first palm groves on the descent into Tafraoute. This was a little taste of the tropics that await us some 1000 kilometers further south. The village is in a dramatic setting amongst huge boulders with the Anti Atlas as a backdrop. Naturally, we had to stay an extra day to explore the area and psych ourselves up for the demanding days in the desert which lie ahead. A quick glance at the map and one might be tempted to think that the coastal road south is a scenic one. In fact, the highway passes through endless stony, inhospitable and very un-picturesque desert known as hamada. 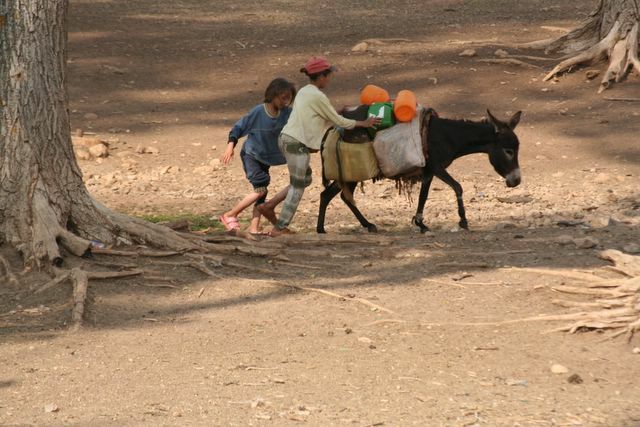 Our chief concerns will be obtaining water, since the region is sparsely populated with settlements often over 100 km apart, and combating the boredom of the monotonous landscape. Time to load some new tunes on to the MP3 player and practice some in-the-saddle meditation!